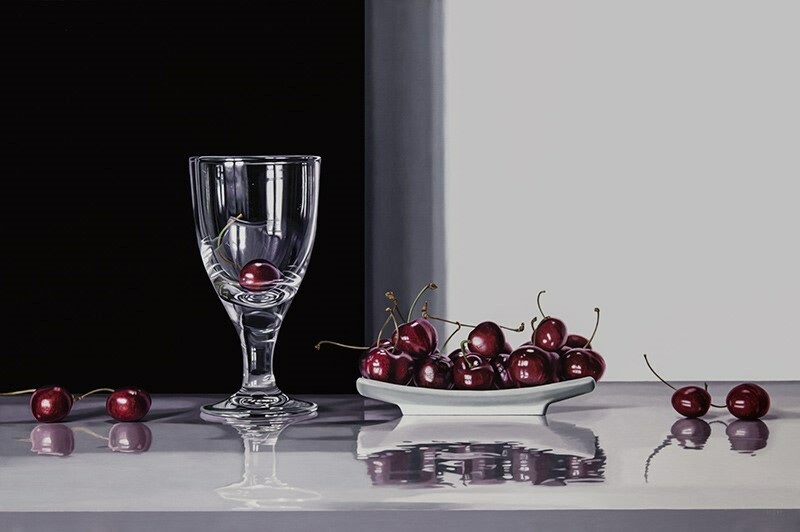 Born in Montevideo, Elena Molinari is best known for her still life paintings of fruit and vegetables, often placed in fruit bowls or alongside glass vases and silk cloths. Molinari works mostly with oil on canvas and is also renowned for her glossy, highly finished paintings of crumpled coca-cola cans. Since 1996, she has lived and worked in Spain, working as an Arts Professor at the University of Madrid. She has enjoyed success beyond Spain, both in her native Uruguay and in galleries across the world. We catch up with Molinari to discuss the inspiration behind her exquisite paintings. WAS IT ALWAYS YOUR PLAN TO BE AN ARTIST? WHERE DID YOU STUDY? 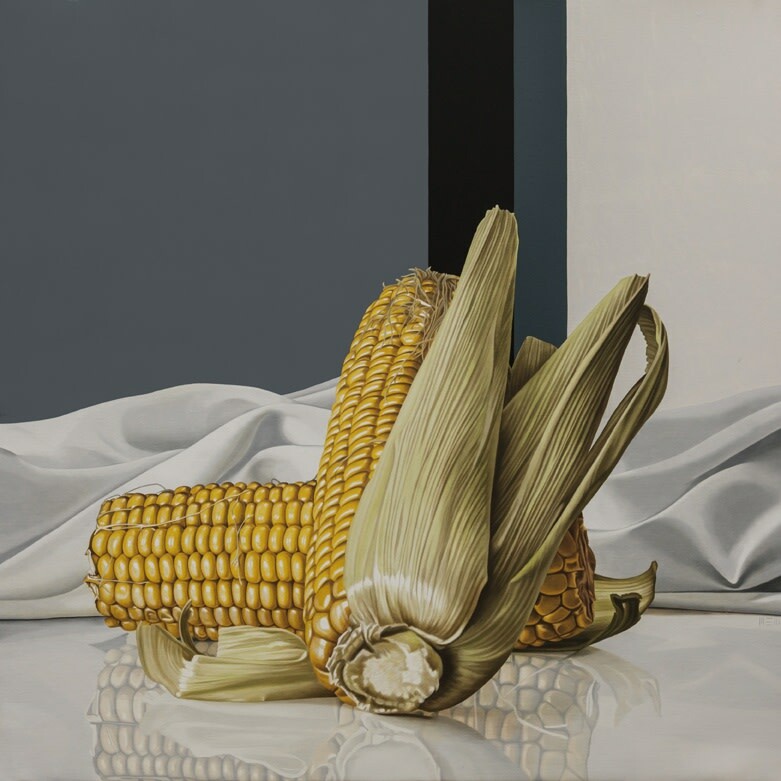 I have always been a figurative and realist artist and becoming a Hyperrealist was the way my practice evolved. I worked as a professor in the Faculty of Fine Arts at Complutense University in Madrid for 16 years teaching Print and Relief techniques but gave it up to become a full time artist in 2012. I studied in Uruguay, my native country. My process begins with an idea of what I would like to paint. Once that idea is clear in my mind I gather all the elements I need to create the composition; I play around with the composition until I get the balance I am looking for. Then I start taking photographs, sometimes hundreds until I get the image I want. During this process I have to act fast as a lot of subject matter is perishable; flowers and fruits don’t last long. From the chosen photograph I do a lineal drawing onto canvas and from here, I start painting. I work with oils applied in many layers, based on transparencies. HAS YOUR WORKED CHANGED SINCE YOUR EARLY DAYS? Yes, it has, technically - from drawing, to prints, to oil on canvas where I am today. My subject matter has evolved too as I began my artistic venture at the age of twenty; this development has occurred naturally with age and with a better understanding and use of painting techniques. For me, the digital camera was not the most important change; the computer and editing programs such as Photoshop have allowed artists to retouch and manipulate their photographs quite easily. I have always used a camera during my artistic process but having the ability to now edit my compositions using the right software has enabled me to make even more artistic choices. I haven’t got a single favourite artist. I’ve got many favourite artists! I believe that all artists have been influenced by the big Masters in one way or another, sometimes we may not even be aware of it. For me the Masters are extremely important and I am influenced by many. Some of my favourite artists are; Hieronymus, Bosch. Johannes Vermeer, Albrecht Durer, Diego Velazquez, William Turner, MC Escher to name a few. THROUGH YOUR PAINTINGS YOU HAVE PORTRAYED BRANDED OBJECTS SUCH AS CRUSHED COCA COLA CANS. WHERE DID THIS IDEA ORIGINATE FROM? Coca Cola tins are fascinating objects for me. I buy them, drink them and then crush them into the shape I want, transforming them into a different object to the one that I bought. Then placing many of these crushed cans together transforms them into a different object yet again. Being able to produce these transformations as many times as I want allows me to create new compositions time and time again. The experimentation began when my nieces and nephews came to visit, they started to collect the cans they had drunk and we ended up with bags full of them. After a while they were no longer interested in the cans and I was left with them. I started playing around with them, which led to my first can painting, a kind of tribute to the time we spent together. From there I started working with cans. WHAT INSPIRED THE RECENT CHANGE IN YOUR SUBJECT MATTER, TRANSITIONING FROM BRANDED OBJECTS TO STILL LIFE? My still life paintings were a necessary balance from spending so much time creating my work around cans. After focusing on one item/medium and its variations for so long, exploring other textures and subject matters came as an organic evolvement in my work. THERE IS ALWAYS A VERY STYLISTIC BOLD, BLOCK BACKGROUND IN YOUR STILL LIFE PAINTINGS. WHAT IS THE IDEA BEHIND THIS? 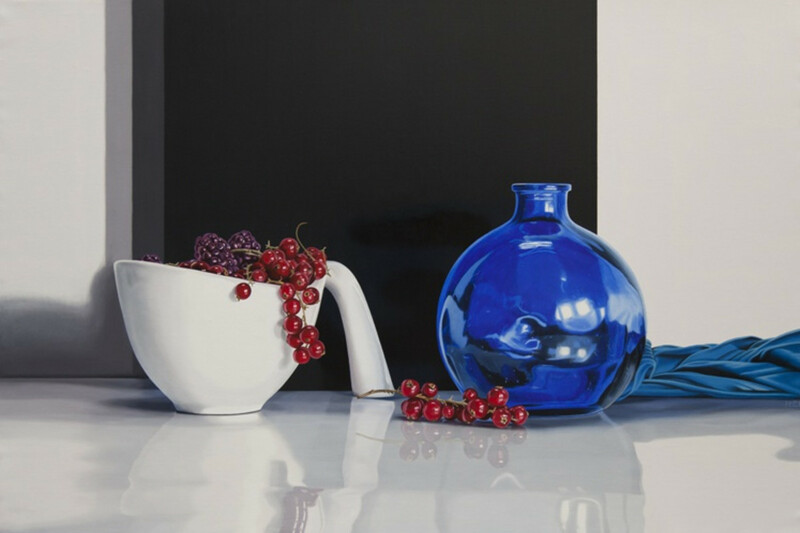 I paint the dark block colours in the background of these paintings to enhance the objects in focus and to help them define themselves in the space created. For me this adds depth and a more hyper-realistic quality. A VARIETY OF MATERIALS ARE CONSISTENTLY PRESENT IN YOUR WORK. WHAT CHALLENGES DO YOU FACE WHILST PAINTING A COMBINATION OF DIFFERENT TEXTURES? After so many years of painting cans and looking for a balance between so many flat, metal objects I needed to focus on something new. 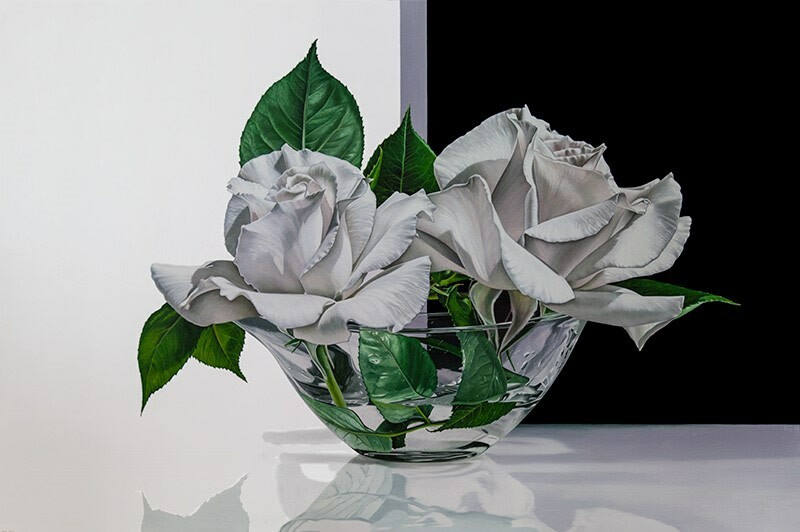 Hyperrealist artists emphasise objects details and often add pictorial elements which help create the hyper-realistic effect. In reality these intricate details could not be seen by the human eye. I began looking at new textures; fabrics, glass vases, flowers and fruit, to name a few. 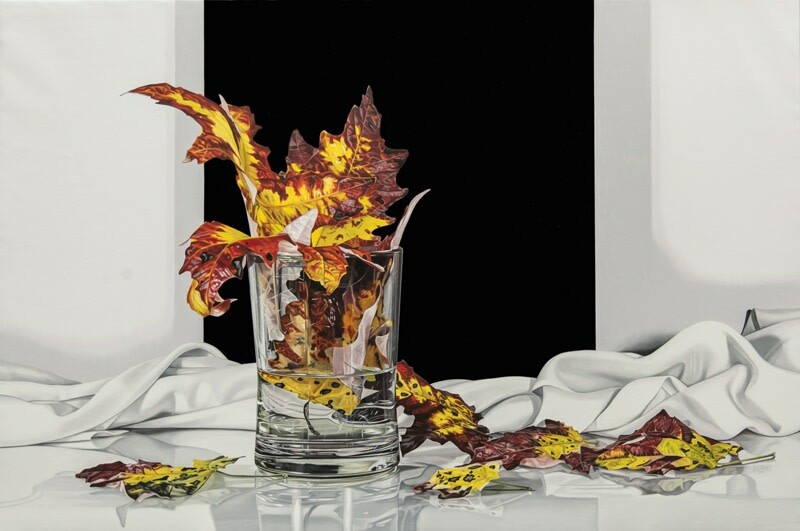 Glass features quite often in hyper-realistic paintings. The reflective surface really helps to create the heightened illusion. My change in subject matter and the challenges I face painting a variety of different materials is something I love.